A rigorous and innovative approach for integrating environmental policies and fiscal reform for the U.S. economy. Energy utilization, especially from fossil fuels, creates hidden costs in the form of pollution and environmental damages. The costs are well documented but are hidden in the sense that they occur outside the market, are not reflected in market prices, and are not taken into account by energy users. 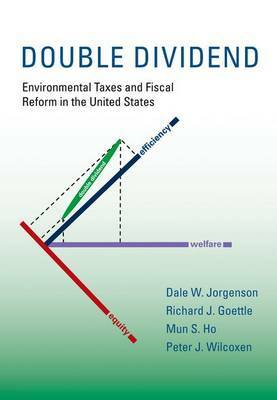 Double Dividend presents a novel method for designing environmental taxes that correct market prices so that they reflect the true cost of energy. The resulting revenue can be used in reducing the burden of the overall tax system and improving the performance of the economy, creating the double dividend of the title. The authors simulate the impact of environmental taxes on the U.S. economy using their Intertemporal General Equilibrium Model (IGEM). This highly innovative model incorporates expectations about future prices and policies. The model is estimated econometrically from an extensive 50-year dataset to incorporate the heterogeneity of producers and consumers. This approach generates confidence intervals for the outcomes of changes in economic policies, a new feature for models used in analyzing energy and environmental policies. These outcomes include the welfare impacts on individual households, distinguished by demographic characteristics, and for society as a whole, decomposed between efficiency and equity.